Choosing the right supplement for your show livestock project can be a mind boggling. Do a quick Google search of “Livestock Show Supplements” and you’ll find hundreds of gels, pastes, pellets and grains to add to your livestock feed to enhance about every trait imaginable. You can find supplements to convert muscle mass, create muscle shape, grow hair, help ease joint pain, aid in digestion, give an animal energy, calm an animal down and so much more. But, the first thing any livestock feeder needs to do is determine what specific challenges he or she needs help with before adding unnecessary and costly supplements to their feeding program. Nearly 70-percent of immune cells are found within digestive tract, so it is vital to keep the gut right. If the gut is healthy, your show animals will be in better health and better withstand any health challenges that come their way. If their digestive system isn’t healthy, their overall health system is compromised, and that is something most livestock feeders and exhibitors don’t have time to worry about or manage. Amaferm is a precision-based prebiotic designed to enhance digestibility by amplifying the nutrient supply within for maximum performance. Therefore, no matter what feed or other supplements you are feeding, the Amaferm will maximize the nutrient intake and absorption from those other ingredients. With many supplements, you might feed them for a specific phase or time period, depending on the animal’s growth or stage of production. 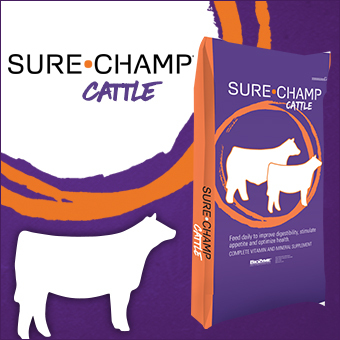 With a digestive supplement like Sure Champ, you will want to feed that every day your animal is in the barn to keep them healthy and on feed and water. “Amaferm is always relevant. Amaferm will always be important no matter their stage or regardless of what feed they are on. It impacts how other feeds works and helps with overall intake, digestibility and absorption,” Rodgers said. Yes, supplements do have their place if you have pin-pointed a specific need for one of your animals. 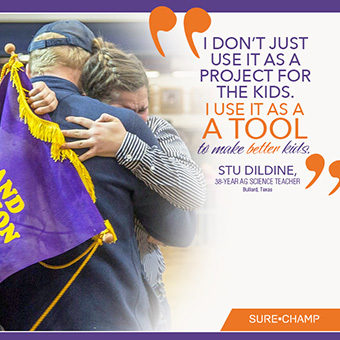 But every animal needs to remain healthy and stay on feed every day, and you can accomplish that with the Amaferm advantage available in all Sure Champ and Vita Charge® products.